My current bead embroidery project is giving me a chance to focus on my decision-making process in several new ways, at least new to me! I thought that some of you might like to see "behind the scenes", and learn what goes into making a large bead embroidered necklace. 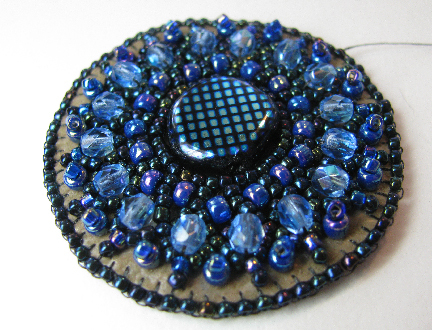 I knew to begin with that this piece was going to use some free-form versions of the bead embroidery motifs that I've spent months developing from bead weaving stitches. These are the motifs that are featured in Bored By Back Stitch, my most recent e-book. For the book, I stitched each motif as a separate entity, but now I wanted to see how they could be used together in a piece. To stay true to the spirit of the book, I decided to create the majority of the design by using the motifs, and use back stitch and bead stacks only to fill in the gaps. Ok, so the techniques have been decided, but what will the necklace be about? I like to have a story in mind, even if it's just a scrap of a story, in order to inspire the look and feel of my pieces. I can start with a special object or a color scheme or any number of other prompts, but there has to be something in my mind to tie it all together. This is the theme of my first e-book, Every Bead Has a Story. It works best for me when there is story that needs to be told. As my friends know, that still doesn't help me when I go to name the pieces, but at least it keeps me on track when I'm making them! For some time now, I've had in my mind a very feminine version of a steampunk style necklace. 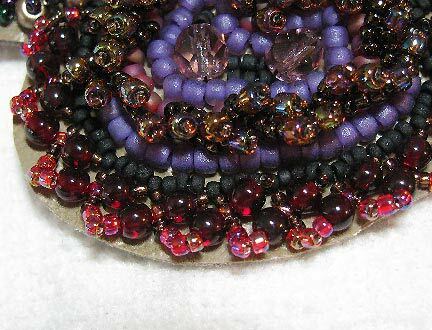 My bead motifs remind me of gears, and I thought that look could be enhanced by picking the right colors and overlapping the motifs. So there was my "scrap of a story": this will be a necklace for a woman who wants something completely new (me! 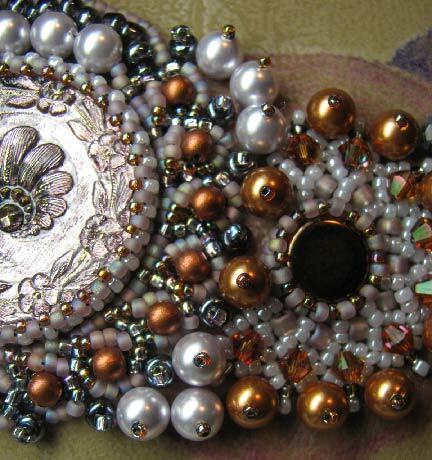 ), not exactly steampunk, certainly not traditional, but with lots of traditionally feminine elements like pearls and crystals. She doesn't care if her jewelry matches her clothing, and she likes to keep people guessing...who is she really? She defies the usual categories. So what about the colors? Gray, grayed lavender, and copper. Why? I like the combination. It's a nod towards the metallics of steampunk, but softer and more unique. It's a mix of cool and warm colors, which could be very jarring if they aren't kept in balance. 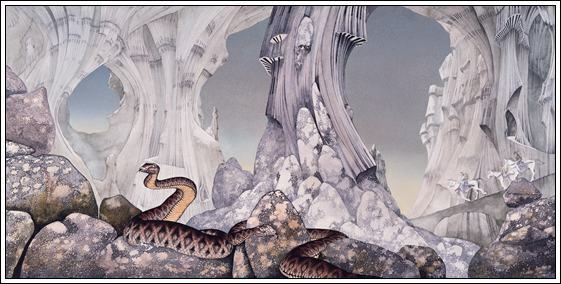 And after I picked the palette, I realized that it reminded me of the cover art of the Yes album Relayer, of which I own a print. Many people think it's "boring" because it's all tones of gray, but I think it's subtle and marvelous (otherwise I wouldn't have bought it, huh?). Supplies were easy! 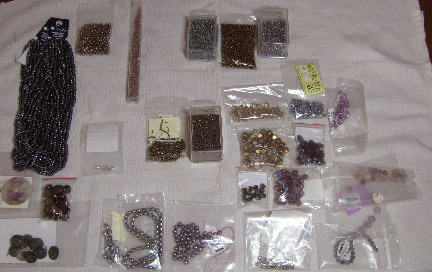 I already had lots of seed beads, crystals, and pearls in the right colors, including several choices for focals, but I did need a few fill-ins, especially seed beads. Well, there are still lots of choices to be made, and I'll show you more the next time...stay tuned!